So JVZoo has had this little “hack” for a while, but I wanted to show you how to use it because it allows you to put buyers of products you're an affiliate for on your own list. Example: I'm going to be promoting a product for David Eisner. 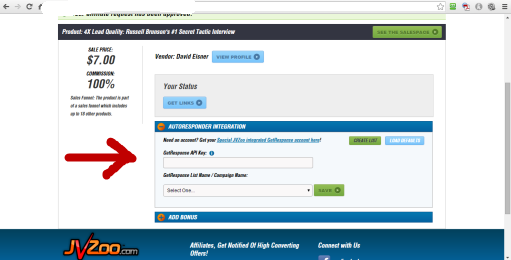 When people buy through my affiliate link I'd like to have them put on a list within my autoresponder account. I'd create a list something like deisner4xleadquality so that I knew what the list was. Once those people are on that list I can send them bonuses for buying, related products, and whatever else I wanted. This is a HUE benefit for people who are doing affiliate marketing without a list because then BUYERS get added to your list seamlessly! And it's a HUGE benefit for those who already have a list because you can create BUYERS list that are super targeted. All you have to do is when you find a product you want to promote in JVZoo, apply to get approval and get your link. On that same screen is a place where you can put what list you want people who buy through your link to be added to. Hint: You could even create “category” type lists. For example anyone who buys a product through your link on affiliate marketing could go on your affiliate marketing buyers list. Or anyone who buys a product through your link on traffic could go on a traffic buyers list. Okay… A little advanced tactics, but wanted to share to help you guys out! As an affiliate marketer you need to have a “hub” where you can keep all your affiliate links, keep up with stats, and more. In this video I'll show you how I've created my own “affiliate marketing hub” and how you can do the same thing! Click here to download the resources document that goes with this video. All the resources mentioned in this video and other tutorials are in this document. Note: If you would like for us to setup your own affiliate marketing hub (please watch the video above first so you know exactly what we will be doing for you) please click here for ordering information.